Recovery School District | Educate Now! The state has released data on high school performance. 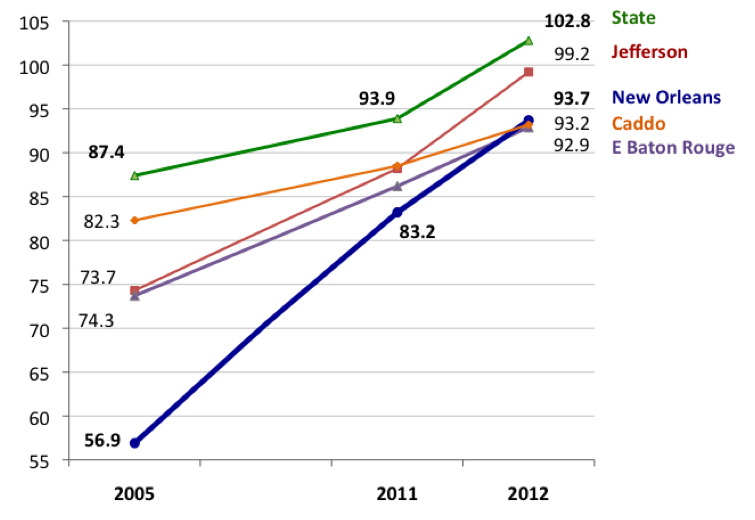 New Orleans showed robust growth on the End of Course Tests (EOCs). New Orleans1 (OPSB & RSD) is 8th in improvement in the state, with 59% of students proficient (scoring Excellent or Good) compared to 52% in 2013. This is a jump of 7 percentage points; the state improved 3 points, from 59% to 62% proficient. Compared to the other 69 districts, New Orleans is now #37, up from #47 last year (up 11 spots). When we look at all New Orleans2, including Type 2 charters and NOCCA, 61% of students are proficient, just 1 point below the state average. The state has been phasing in the EOCs by testing more subjects each year. This year, for the first time, all six subjects were tested: Algebra, Biology, English II, English III, Geometry and U.S. History. Since 2011, New Orleans has improved 14 points, while the state has improved 7 points. See below for EOC performance by school. All students are now required to take the ACT. Many take it multiple times, and ACT uses their highest score. Looking at all New Orleans high schools, 50% of students scored an 18 or higher, up 6 points from 44% in 2013. Statewide, 59% of Louisiana students scored an 18 or higher, a 1 point gain from 2013. 18 is the score that ACT says is aligned with college success. 91% of New Orleans students are in charter schools. Enrollment keeps increasing by around 1,500 students per year. New Orleans schools have grown more diverse since Katrina. *2013-14 does not include 0-3 enrollment or NOCCA (which dropped below 50% N.O. enrollment) but does include Milestone SABIS (with over 50% N.O. enrollment). According to a recent market share report, New Orleans has the nation’s highest percentage of public school students in charters. In 2012-13, Detroit was second with 51% percent in charters, and Washington, D.C. was third with 43%. Also, when the Recovery School District closes its last four direct-run schools at the end of this school year, it will become the nation’s first all-charter district. UPDATE: This post has been updated to reflect corrected state data that increased charter enrollment from 90.2% to to 91%. The Recovery School District (RSD) and the Orleans Parish School Board (OPSB) announced the results of the first year of the new expulsion policy for public schools in Orleans Parish. Not only is New Orleans leading the state in academic gains, we are doing so while expelling fewer students than the state average. What did New Orleans do differently in the 2012-13 school year? Common expulsion process and definition: Charter and traditional school leaders across the RSD, OPSB, and Type 2 charter schools worked together to establish a joint policy and coordinate a centralized process for student expulsions. 2013 Test Scores Are In, and We Rock! … Again!! Student performance showed robust improvement for the 6th consecutive year. New Orleans (OPSB & RSD) is #1 in growth, gaining 5 points in the percentage of students meeting the state proficiency goal of Basic or above. This growth was fueled by RSD-New Orleans, with its 6 point gain. OPSB grew 1 point, equal to the state average. Students improved across all grades and subjects. Schools under the OPSB serve a disproportionately low number of students with disabilities. The city average is 9.9% special education students, but OPSB schools (charter and traditional combined) serve 6.6%. OPSB charters serve only 5.49% while RSD charters serve 11.1%. Even OPSB’s open-admission charter schools are significantly under-serving special education students. OPSB receives a lump sum based on the total number of students with disabilities in the city. It then distributes the money among its schools as if each individual school had the average 9.9% special education enrollment. That means some OPSB schools are getting much more than their fair share of special education dollars, while other schools aren’t getting enough. There has been much discussion about how folks really view education reforms in New Orleans. Last week, Tulane’s Cowen Institute released a 2013 public opinion poll providing data that replaces pure speculation with poll results on how voters feel about key issues. The need for the Orleans Parish School Board (OPSB) to make structural and operational changes before schools are returned (65%), with a strong preference (41%) for a local school board with a mix of elected and appointed members; only 16% of voters believe OPSB as currently structured should have oversight of all charter schools. While black and white voters disagreed on when to return schools, the majority (55%) feel return should be in the more distant future (3-5 years) or never. Close to 80% of Students Graduating on Time! 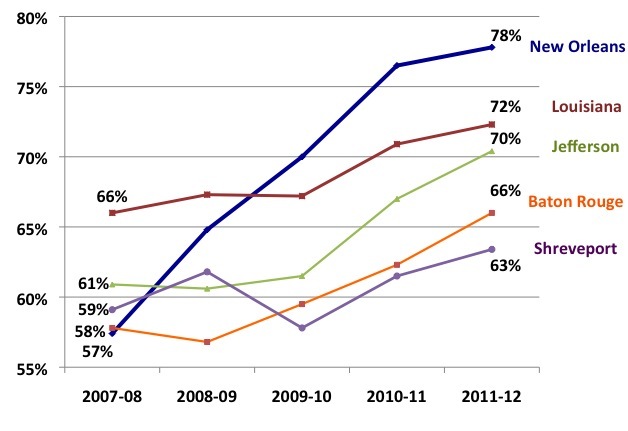 The state has released the four-year cohort graduation rates for 2012, and the news is good for New Orleans. The combined graduation rate for all New Orleans public schools rose to 77.8%. The New Orleans graduation rate of 77.8% compares well to the rest of the country. According to the U.S. Department of Education report released in November, in 2011 the national average graduation rate for African American students was 60%, and the national average for white students was 76%. In New Orleans, public school enrollment is 88% African American, 6% white and 6% other. New Orleans outperformed the state of Louisiana (72.3%). New Orleans also outperformed Shreveport (63.4%) Baton Rouge (66%) and Jefferson Parish (70.4%). RSD-New Orleans is among the most-improved districts, going from a graduation rate of 58.8% in 2011 to 67.7% in 2012. RSD-New Orleans ranks #49, outperforming Baton Rouge and Shreveport. The RSD took over the worst performing high schools in the state. This progress in just a few years is remarkable. OPSB has the highest graduation rate in the state, although it dropped from 93.8% in 2011 to 89.3% in 2012. With the recent release by the U.S. Department of Education of national high school completion rates, New Orleans has cause to celebrate. In terms of graduating students on time, we have closed the performance gap. New Orleans outperformed the state and outperformed the nation. States are now required to use a common measurement for high school completion: the percent of first time 9th graders who graduate within 4 years with a regular diploma (the 4-year cohort graduation rate1). The data on the graduating class of 2011 shows that nationally 76% of white students and 60% of black students graduated on time. New Orleans had 2,051 high school graduates in 2011, 443 more than if we were at the national average for black students, and 657 more than if we were still at New Orleans’ 2005 graduation rate. This improvement is a game changer for our students and our city. Since 2005, the District Performance Score (DPS) for New Orleans has grown an astonishing 36.8 points, more than any other district in the state. For the first time, New Orleans has a higher DPS than both East Baton Rouge and Caddo (Shreveport) Parishes. New Orleans has closed the gap with the state average by 70%. In 2005, New Orleans was over 30 points behind the state. In 2012, New Orleans is only 9.1 points behind the state. Earlier this month, the state released the results of the End of Course tests (EOCs). Louisiana has phased out the Graduation Exit Exam (GEE) and replaced it with EOCs. EOCs count for at least 15% of a student’s grade in the course. School Performance Scores will now be calculated using EOC results instead of the GEE.